If you thought Jurassic World had the craziest picture of dinosaur behavior, get ready to be reminded that reality can always get weirder. Researchers have found evidence that dinosaurs danced, both to terrify their enemies and impress their would-be lovers. That’s the conclusion of a group of international scientists, led by Martin Lockley at the University of Colorado, Denver, who just published their findings in Scientific Reports. Lockley is a geologist, and found large-scale scrapes in rock which indicate the dinosaurs engaged in the same kind of courtship displays that we associate with birds. How can they possibly deduce that from just a few scrapes in rock? To begin with, they weren’t just one set of scrapes. Researchers found similar scrapes at three different sites—two in Colorado and one in Dakota. Both sites were what’s known as “leks,” display arenas where dinosaurs would get together to check out who was on the market, sexually speaking. The scrapes are not small. 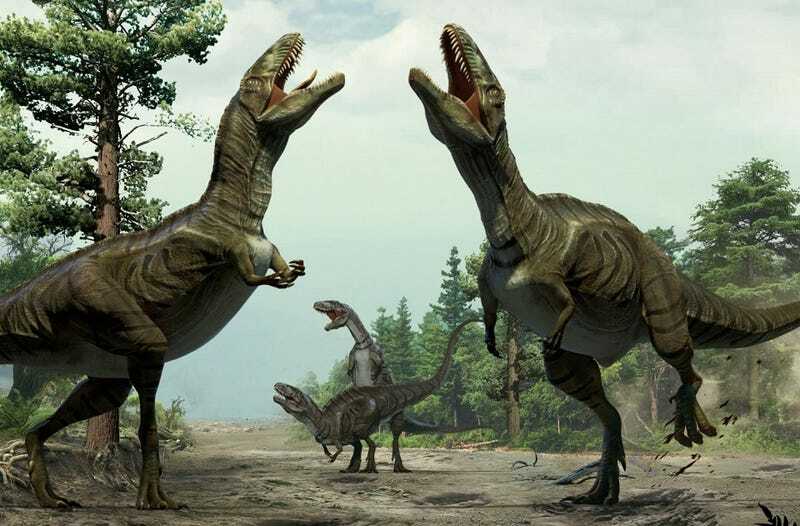 The researchers think they were made by theropods, a big group of bipedal and carnivorous dinosaurs that included tyrannosaurs and raptors. Some of the scrapes were as deep as bathtubs. We should think of the scrapes not as early evidence that sparked a new theory, but as evidence that corroborates an existing theory. The link between dinosaurs and birds has been well established. Dinosaurs did have bird-like behaviors like nest-building. Birds are well-known for their courtship displays, so dinosaurs very well might have been the originators of such displays. Scientists were also intrigued by signs of sexual dimorphism in dinosaurs: physiological differences between females and males that went beyond genitalia. The differences were not obvious—the paper mentions “subtle differences in oviraptosaur tail morphology,” but they were present. The scientists wondered if they were there not for practical reasons, but for a kind of courtship display. In ornithological journals, scraping behaviors are called “nest scrape displays,” or “scrape ceremonies.” The scientists compared the scrapes they found at the dinosaur leks to scrapes done during displays by shore birds, ostriches, the rare New Zealand kakapo, and the puffin.